EXECUTIVE SUMMARY: If week-long anti-government protests in Iran exposed the Islamic Republic’s deep-seated economic and political problems, they also laid bare Saudi Arabia’s structural inability to establish itself as the leader of the Sunni Muslim world. The responses by major Sunni Muslim countries in the Middle East and North Africa to the recent anti-government protests in Iran demonstrated that none of the contenders for regional dominance and leadership, which include Turkey and Egypt, were willing to follow the Saudi lead. 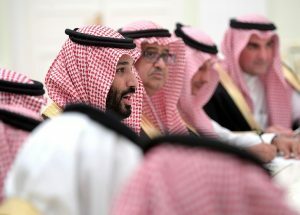 In fact, the responses appeared to confirm that regional leadership was more likely to be shared among Turkey, Egypt, and Iran than decided in the debilitating power struggle between Saudi Arabia and the Islamic Republic, a struggle that has wreaked havoc across the region and which the Kingdom is losing. Uncharacteristically, Saudi Arabia under the rule of King Salman and his son, Crown Prince Muhammad bin Salman, has refrained from commenting on the protests. The kingdom has also been silent in the walk-up to US President Donald J. Trump’s decision on what to do about American adherence to the 2015 international nuclear agreement with Iran. While Saudi media, oblivious to the potential for dissent in the kingdom, gloated about the exploding discontent in Iran, Saudi leaders stayed quiet in a bid to avoid providing Iranian leaders with a pretext to blame external forces for the unrest. (That did not stop Supreme Leader Ayatollah Ali Khamenei and other Iranian leaders from laying the blame at the doors of Saudi Arabia, Israel, and the US). Similarly, Saudi Arabia, whose regional prominence is to a significant extent dependent on American, if not international, containment of Iran, stayed on the sidelines as Trump deliberated undermining the agreement that for almost three years has severely restricted Iran’s nuclear program and halted the Islamic Republic’s ambition of becoming a nuclear power any time soon. While the Saudis would welcome any tightening of the screws on Iran, they have come to see the agreement as not only preventing Iran (at least for now) from developing a military nuclear capability but also as avoiding a regional nuclear arms race in which Turkey and Egypt as well as, potentially, the United Arab Emirates would take part. The agreement gives the kingdom an opportunity to set up building blocks for a future military nuclear capability, if deemed necessary. Trump’s apparent willingness to ease restrictions on Saudi enrichment of uranium as part of his bid to ensure that US companies play a key role in the development of Saudi Arabia’s nuclear energy sector facilitates the Saudi strategy. In contrast to the Saudis, Turkish president Recep Tayyip Erdoğan was vocal in his support for the Iranian government and called Iranian President Hassan Rouhani to express his solidarity. Egypt, like Saudi Arabia, has not commented on the protests but has studiously avoided being sucked into the Saudi-Iranian rivalry, including its multiple proxy battles in Yemen and elsewhere. The various responses to the Iranian protests reveal more than simply differences of evaluation of those events. They show the fault lines of two, if not three, major alliances that are emerging among the contenders for regional leadership in the Middle East and North Africa and adjacent regions like the Horn of Africa. They also highlight Saudi Arabia’s inability to garner overwhelming support for its ambitions and/or efforts to achieve them. Those efforts include the kingdom’s declaration of an economic and diplomatic boycott of Qatar; its military intervention in Yemen; and its failed attempt to force the resignation of Lebanese Prime Minister Saad Hariri. Turkey has effectively sought to counter Saudi moves not only by forging close ties to the Islamic Republic despite their differences over Syria, but also by supporting Qatar with a military base in the Gulf state. It has also kept up a supply of food and other goods into Qatar, the flow of which had been interrupted by the Saudi-led boycott. Turkey has established a military training facility in Somalia and is discussing creating a base in Djibouti, the Horn of Africa’s rent-a-military base country par excellence (it contains foreign military facilities operated by France, the US, Saudi Arabia, China, and Japan). Turkey also recently signed a $650 million agreement with Sudan to rebuild a decaying Ottoman port city and construct a naval dock to maintain civilian and military vessels on the African country’s Red Sea coast. Saudi Arabia sees the Turkish moves as an effort to encircle it. Turkey, to the chagrin of Saudi Arabia and its closest regional ally, the UAE, as well as Egypt, has supported the Muslim Brotherhood as well as other strands of political Islam. Egypt recently launched an investigation into embarrassing leaks from alleged intelligence officers that were broadcast on the Brotherhood’s Istanbul-based Mekameleen TV station and published in The New York Times. Egypt has denied the accuracy of the leaks. If Saudi Arabia, backed by the UAE, Bahrain, and Israel (as an unacknowledged partner) constitutes one bloc, Turkey forms another that could include the region’s third pole, Iran. Egypt, conscious of its past as the Arab world’s undisputed leader, may not yet be able to carve out a distinct leadership role for itself, but it is working hard to keep the door open. Underlying the jockeying for regional dominance is a stark reality. Turkey, Iran, and Egypt have, to varying degrees, crucial assets that Saudi Arabia lacks: large populations, huge domestic markets, battle-hardened militaries, resources, and a deep sense of identity rooted in an imperial past and/or a sense of thousands of years of history. Saudi Arabia has its status as custodian of Islam’s most holy cities and financial muscle. In the long run, those are unlikely to prove sufficient.